The John F. Kennedy Speech, We choose to go to the Moon featured is in the form of extracts, passages or lines from the John F. Kennedy Speech, We choose to go to the Moon. The John F. Kennedy Speech, We choose to go to the Moon demonstrates good oratory skills, a great public speaker with the ability to use clear words and text. Speech Example Topic / Subject Type: Inspirational / Inspiring Speech. No man can fully grasp how far and how fast we have come, but condense, if you will, the 50,000 years of man's recorded history in a time span of but a half-century. Stated in these terms, we know very little about the first 40 years, except at the end of them advanced man had learned to use the skins of animals to cover them. Then about 10 years ago, under this standard, man emerged from his caves to construct other kinds of shelter. Only five years ago man learned to write and use a cart with wheels. Christianity began less than two years ago. The printing press came this year, and then less than two months ago, during this whole 50-year span of human history, the steam engine provided a new source of power. Newton explored the meaning of gravity. Last month electric lights and telephones and automobiles and airplanes became available. Only last week did we develop penicillin and television and nuclear power, and now if America's new spacecraft succeeds in reaching Venus, we will have literally reached the stars before midnight tonight. Those who came before us made certain that this country rode the first waves of the industrial revolution, the first waves of modern invention, and the first wave of nuclear power, and this generation does not intend to founder in the backwash of the coming age of space. We mean to be a part of it--we mean to lead it. For the eyes of the world now look into space, to the moon and to the planets beyond, and we have vowed that we shall not see it governed by a hostile flag of conquest, but by a banner of freedom and peace. We have vowed that we shall not see space filled with weapons of mass destruction, but with instruments of knowledge and understanding. In the last 24 hours we have seen facilities now being created for the greatest and most complex exploration in man's history. We have felt the ground shake and the air shattered by the testing of a Saturn C-1 booster rocket, many times as powerful as the Atlas which launched John Glenn, generating power equivalent to 10,000 automobiles with their accelerators on the floor. We have seen the site where five F-1 rocket engines, each one as powerful as all eight engines of the Saturn combined, will be clustered together to make the advanced Saturn missile, assembled in a new building to be built at Cape Canaveral as tall as a 48 story structure, as wide as a city block, and as long as two lengths of this field. To be sure, all this costs us all a good deal of money. This year's space budget is three times what it was in January 1961, and it is greater than the space budget of the previous eight years combined. That budget now stands at $5,400 million a year--a staggering sum, though somewhat less than we pay for cigarettes and cigars every year. Space expenditures will soon rise some more, from 40 cents per person per week to more than 50 cents a week for every man, woman and child in the United States, for we have given this program a high national priority--even though I realize that this is in some measure an act of faith and vision, for we do not now know what benefits await us. But if I were to say, my fellow citizens, that we shall send to the moon, 240,000 miles away from the control station in Houston, a giant rocket more than 300 feet tall, the length of this football field, made of new metal alloys, some of which have not yet been invented, capable of standing heat and stresses several times more than have ever been experienced, fitted together with a precision better than the finest watch, carrying all the equipment needed for propulsion, guidance, control, communications, food and survival, on an untried mission, to an unknown celestial body, and then return it safely to earth, re-entering the atmosphere at speeds of over 25,000 miles per hour, causing heat about half that of the temperature of the sun--almost as hot as it is here today--and do all this, and do it right, and do it first before this decade is out--then we must be bold. The text featured is in the form of extracts, passages or lines from the John F. Kennedy Speech, We choose to go to the Moon. 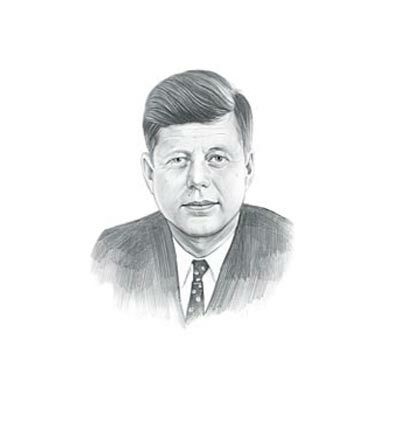 This famous John F. Kennedy Speech, We choose to go to the Moon is a great example of a clear address using excellent text to persuade and inspire the audience, a natural leader and motivator a President of America. Use this famous transcript of the John F. Kennedy Speech, We choose to go to the Moon as an example of a great oration and clear dialogue. This famous transcript of the John F. Kennedy Speech, We choose to go to the Moon originated from a historical manuscript. A Quote or extract from the John F. Kennedy Speech, We choose to go to the Moon, provides an illustration of, or allusion to, the famous events the era. This famous John F. Kennedy Speech, We choose to go to the Moon is famed for its powers of verbal communication making good use of the words and language to illustrate the subject. Whether this address can be described in the category of powerful, persuasive, motivational or inspirational the excellent powers of oration which are used make it one of the most famous Presidential speeches.